Stamford Periodontics and Implant Dentistry Center specializes in dental implant surgery to enhance your smile and improve the health and function of your bone and teeth. 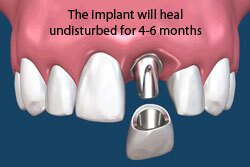 Dental implants are now considered the standard of care when replacing a missing tooth or teeth. Dental implants are artificial substitutes for natural tooth roots. 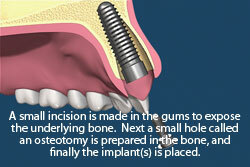 Dental implants (titanium posts) are carefully inserted into the jaw bone where teeth are missing. The bone biologically bonds to the titanium posts through a process called osseointegration. Once osseointegration has occurred, small posts called abutments are attached to the titanium implant(s). The abutments then provide anchors for the crown(s) or denture(s). 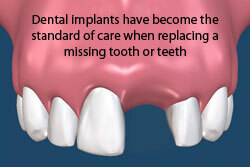 Dental implants are the next best thing to natural teeth. 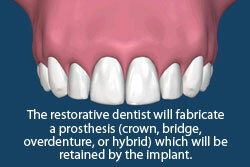 Implants feel and look more natural than bridges, or dentures. Also, implants help preserve facial structure and prevent bone loss and gum recession that often accompany bridgework and dentures because they are placed directly into the jaw bone. Most patients find implants to be a more stable, long-term solution to their tooth loss than the more traditional dental reconstructive approaches. Please contact us if you have any questions regarding dental implants, or if you would like to make an appointment for an implant consultation.